Well, we have all been there, working away on our posts and perhaps even layout functions and thought “If Only I Could Get It To XYZ”. I for one can confirm that this is happening to me frequently. As I am from a raw coding background, the concept allowing a platform to do all the work for me, just is not normal to be honest and the transition has been a major learning curve. However, as we know we see the issues, we know that there must be so many more of you that also see them and simply wonder “now how do you do that”. So we have complied just a few quick tips to help you hopefully find some shortcuts to making your WordPress blog for you. In the WordPress Posts Dashboard, go to the Edit screen for the actual post you wish to schedule in advance or create a new post. Towards the top right of your dashboard, you will notice the Publish settings, within there you will find the “Schedule For:” option. Click on the blue “Edit” text adjacent to “Publish immediately” and simply set the month, date, year and time you want your post to be published and become live content. When you are setting the time, you will need to keep in mind that WordPress uses a 24 hour clock, there 2.30pm will actually become 14.30pm. Getting that wrong might be fundamental to your timing by 12 hours. Once your time and date is set, Click the gray “OK” button. What was the “Publish immediately” text will now change to “Schedule” with whatever date and time you have chosen displayed at the “Schedule For:” section. Once you are happy with your settings, just, click the blue “Schedule” button (previously “Publish”). Your post has now been placed withing the Schedule database and will be launched at the time and date you set. We all know how great WordPress is a simply creating URL’s relevant to the title of your page/post title. However there are times when you just need to tweak that URL a little to suit your needs a little better. From within the WordPress control panel, navigate your way to the Edit screen for the post or page you wish to edit. Below the title, you will notice the button titled “Edit” button next to the post/page permalink. The URL text within the box will become highlighted ready for you to alter to suit your needs. Before making your changes, you will notice that each word is separated by the – symbol, it is important that your changes reflect this rule and are also separated in the same way. In order for WordPress to actually see the changes and apply those changes to the page/post URL, you will actually need to confirm the change by clicking the “Publish” or “Update” button, within the Publish panel. Now anybody who knows me, knows that a I am old school with my raw code preferences over text WYSIWYG editors, therefore I have had to ask my staff to compile this little list of hints and tricks for you. WordPress has a great little text editor built into it, most people stick with the “Visual” option rather then the “Text” viewer. This sections covers just that the “Visual” editor. At the end of this tip is going to be a clue that will also enable you to increase the power of the WordPress basic editor. Why not try out the tips below to help speed up your workflow and eliminate many common spelling mistakes and website design issues. Perhaps one of most powerful, yet least used function within the WordPress editor has to simply be the spell check option.This is a simple step that many people miss. So many WordPress users think that it is all about the post and content, but before they publish they forget to do a spell check, yet it is so simple and only takes a few seconds to do. Once you have completed your post or page content, (regardless of if you spell check visually as you go along), just click the “ABC” button above your content. You will then be taken on a whistle stop tour of post/page picking out any words that WordPress is unable to recognize and suggestions will be made to correct the mistake/s. Now we have all been there and we have all done this and found the following issue. Now personally I only copy and paste from MS Notepad, less chance of this happening. But should you find when you copy text from Microsoft Word or any other word processing package, that the text still just does not look quite right. Perhaps it is is slightly offline or the indents have been carried through in the paste function. Well don’t panic, WordPress even has a option to remove the hidden formatting. Above your text will be the “Show/Hide Kitchen Sink” (not an easy button to spot), the button illustrates boxes or perhaps even tables with squares and rectangles. Click it to display the second row of buttons/options. If you still can not find it try pressing Ctrl+Shift+Z. Select and highlight the text or section that does not appear correctly to you. From the second set of options that appeared, just click on the “Remove Formatting” button. The button that resembles a white eraser that turns pink when you mouse over it. The ever illusive single line break in WordPress can be fun and games to work out, especially when you are using custom themes. You should note here that there is a difference between a single line break and a paragraph break. A single line break simply moves your cursor down to the next line, therefore keeping your paragraph in one piece. However the paragraph break creates a new paragraph with a gap between the new and previous paragraph. In order to create a single line break, instead of just pressing the return key, actually hold down the shift key ad then press return. To do that, just hold the Shift key and hit Return. That’s it. When you want to add a paragraph break, just press the return key. No more special codes or none breaking spaces to be inserted to move your text around. Shortcut keys are a fantastic way to save time, especially for those who are Cash rich, Time poor. We all know the basic Ctrl+c and Ctrl+V for our copy and paste functions. 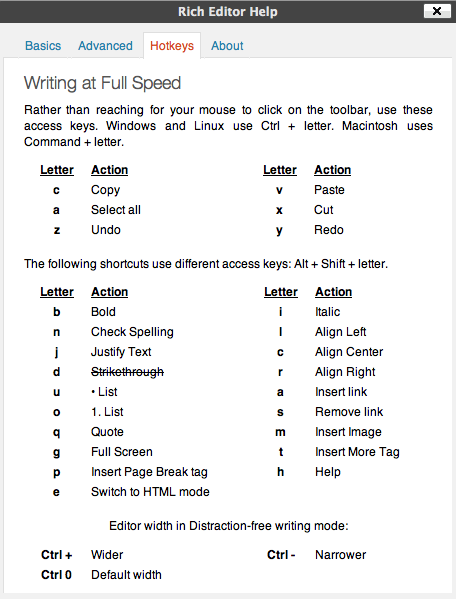 But what about all the rest, there are so many ways in which you could save time by simply learning these little keyboard shortcuts. For a basic list of the popular check out the WordPress image below or if you have a little more time check out the full WordPress post concerning this subject. No matter where we go on the web, we see this question so frequently and perhaps worse still, we see viewers being told they need a special plugin to embed their most basic media types. Well for those who have installed plugins to enable you to add your YouTube, Twitter, Flicker and other media, the simple fact is, most of the time you don’t actually need a plugin to do the embedding for you. WordPress actually already has the function built in for you. Using a simple YouTube video, we will quickly show you how to achieve your embedding without any special plugin’s. Activate your cursor within the text window, where you want the YouTube video to appear, (you might want to ensure that you have a paragraph break above and below your embed location). Returning back to your WordPress dashboard. Simply paste the URL into your desired location, you should avoid trying to align or play around with the display within WordPress right now as it may cause issues with the embedded object. This is where the magic happens, although in your editor you will only see the URL that you have just added, when you actually view or preview the post, WordPress will have made some changes behind the scenes in order to make it functional content. WordPress and Browsers now see as, (we have disabled this URL with extra spaces). The final result being, your video embedded as below. Most blogs will have multiple authors within their content. Therefore is it not only fair that the actual author get the recognition for their own content. By default on a standard WordPress setup, as a general rule see’s you are the only authorized author. If you have not set up the author as an authorized other author’s withing the “User” panel, you can quickly and easily modify the Post Author settings. In order to change the Author settings you will need to be within the blog post/page Edit screen. In the top right corner of the Edit screen you should see the “Screen Options” tab. Click the “Screen Options” tab and a new set of options will appear along side it. Add a tick to the Author check box. Using the drop down menu within “Author” panel, simply select the author that is appropriate for the post. Once you click the “Publish” or “Update” button on the post and it goes live within the blog, the Author will have been changed to your required Author. I will look at this too!! I must admit. I have not conveted to WordPress. I’m a ‘Blogger’ kinda gal myself. Lol. Great article. Got a Worpress site & need to learn more. Thx. Even though I don’t use WordPress I learned some quick tips on the shift alt buttons, sweet! I’ll definitely read this tonight!